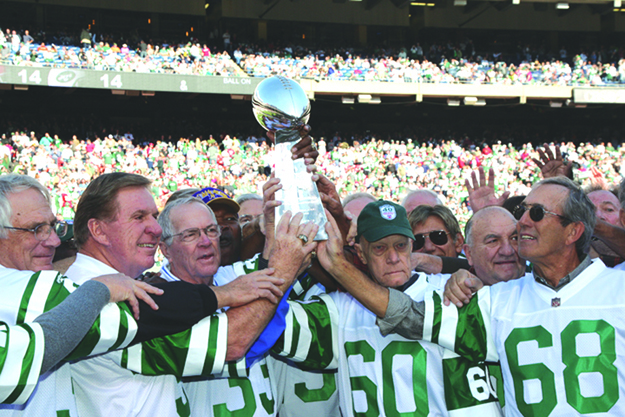 COURTESY PHOTO | The Island’s own Mike Stromberg (far right) and Gang Green teammates celebrate the 40th anniversary of their championship season, October26, 2008 at MetLife Stadium. What’s television’s biggest event of the year? The state of the union address by our President? The Academy Awards? A news program about the war or maybe something about the financial status of the stock market? Wrong, on all counts. Television’s biggest event is coming up in just a couple of weeks — pro football’s Super Bowl. This one day sporting event attracted 111 million viewers last year and has increased every year since its inception back in 1967. This year the Super Bowl will be played again on the first Sunday in February with more than 100 million people sitting by their TV screens with enough appetizers to feed a few families, ready to enjoy the next three hours. On Sunday, February 3, the city of New Orleans will host this major event for the 10th time. By the way, if you were planning on advertising your product for this audience at around $4 million bucks for 30 seconds, sorry, it’s too late. SOLD OUT! The victory prize, beside the money and the glory, is the Vince Lombardi Trophy, An honor bestowed on the Brooklyn boy for an unbelievable career in football both as a player and coach. As a player, Lombardi was a member of the famed “Seven Blocks of Granite” of Fordham University. As a coach with the Green Bay Packers he won five National Football League Championships along with Super Bowls I and II. If you were born before 1960, you possibly could remember when there were two leagues, the American and National. I was one of those people and I’ve watched all the Super Bowls. For me, the most important and interesting game was Super Bowl III, since this was the first time the American football league proved that it was at least an equal to the National league. To this fan, this was the game of games. This contest was about our local team, the AFL’s New York Jets who practiced right here on Long Island. They made it to the top and were slated to play against the National leagues powerhouse Baltimore Colts, a team already touted by the sports media as “the greatest team in pro football history”. The Colts, coached by the great Don Shula, had a 13 and 1 season record, and the Super Bowl was predicted to be a massacre of the inferior league’s New York Jets. However, the Jets had a quarterback nicknamed Joe Willie, or Broadway Joe or just Joe Namath, who after listening to enough dissing of his team by everyone, guaranteed a win. The rest is history as the Jets went on to win Super Bowl III by a score of 16 to 7. One of those Jet players, Mike Stromberg, has made his home right here on Shelter Island for the past 23 years. Like Lombardi, Stromberg is also a Brooklyn boy. Mike went to Temple University in Philadelphia and at the ripe old age of 21 was the only football player from Temple to be drafted. Although Stromberg (number 68 in ‘68) only had a chance to play in a few games that year before blowing out his knee, he was a part of one of the most exciting knockouts in sports history. Stromberg became a friend of Joe Willie. He brought the great Jets running back Emerson Boozer out to the island to play in Gardiner’s Bay’s Member Guest tournament and has himself played in many celebrity golf tournaments through the years. When I spoke to Mike Stromberg he said he finds it interesting that he will always be defined as a football player no matter what else he does in life. He now holds a lot of great memories but I feel the ring that he holds might be his greatest treasure. Next time you are at a function and Mike Stromberg is there, ask to see the ring, I’ll bet he has it on.